Today, the Internet is the number one marketplace where consumers and traders come together, doing away with national borders and boosting the digital economy. With this new economic paradigm, we are facing very new consumer problems. To ensure consumers’ trust and confidence in the digital economy, ICPEN* has published a joint open letter encouraging consumer-facing businesses to review their contractual terms and conditions(TCs) and marketing practices. 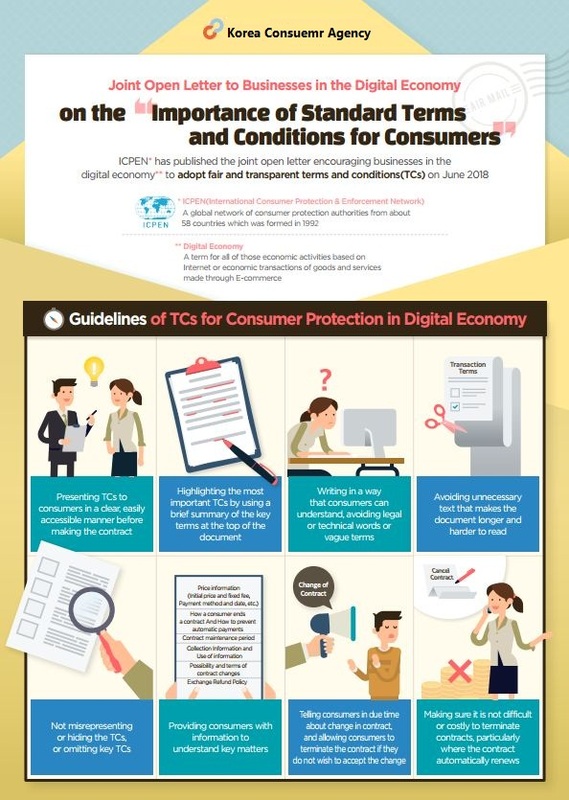 And Korea Consumer Agency(KCA) has created visualized infographic based on the open letter in both Korean and English to widely share the information benefiting consumers and businesses.